Numb fingers, frozen rod eyes and trophy trout! It’s finally winter! 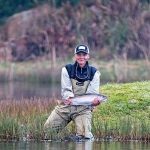 Yes, okay… for most people that isn’t a statement they’re going to openly embrace, but for us trout fishermen we associate winter with big, spawning trout – One of the best times to really have your line tighten up on a monster. Now, I have to emphasise that the months leading up to winter can produce equally as well, but regardless of the exact month; the one common factor in both the middle of winter and the transitional months are the flies you’ll be using. In South Africa, our trout start pairing in May in preparation for spawning which takes place between June and July; because of this, brighter coloured flies, such as your yellows, oranges, pinks, etc. start to become more effective; with orange normally producing the most fish. This is because trout eggs are orange and are eaten by other trout so orange can be a key trigger in getting strikes at this time of the year. But by that I don’t mean you must now head off to your nearest fly fishing store and buy every orange fly available, even a subtle amount of orange can be sufficient. Another factor to bear in mind is that our trout become very aggressive, and although fly selection is key, the best fly won’t aid in your success if you’re unaware of where the trout will be hanging out. Understanding fish behaviour is equally important; for example fish become very territorial and more often than not, can be found hanging around inflows with shallow gravel bottoms. When looking at flies for trophy trout, the variety seems endless. Something I personally look for are flies that have a good balance between your bright colours and your more natural, subtle colours. A good contrast between say, the head and body, or body and tail of the fly works well. Flies that immediately come to my mind would be a flexi hothead, straggle damsel or perhaps an olive f/flapper. All of these Fullingmill flies are not only tied on quality hooks that can confidently handle trophy trout; but they all incorporate natural colours with bright elements. A definite recipe for success. With that being said, one does need to bear in mind that during winter your Stillwater’s are going to be crystal clear. You might then want to opt for smaller flies such as nymphs. In such a situation I will be fishing multiple flies, always incorporating an attractor into my rig. Blobs, Boobies, etc. are good choices. I’ll either fish them subsurface or as an indicator. 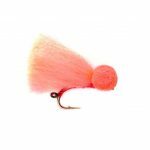 The Aero Orange fly by Fullingmill works great as an indicator as it is tied with a tippet ring in the bend of the hook – a much better option than tying your tippet onto the shank of the hook. As mentioned earlier, winter isn’t the only time of year for trophy fish. 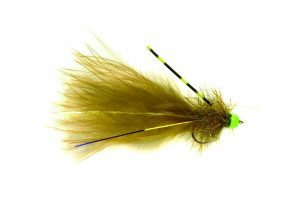 In the warmer months you still have a chance of hooking a big boy – with fly choice once again being one of the crucial factors determining success or not. In South Africa we are very fortunate that the majority of Stillwaters are man-made dams and lakes in which trout are routinely stocked. This means that there are no closed seasons for spawning allowing us to hunt big fish all year round. Large flies can be effective for trophy fish, and streamers are one of my “go-to” patterns with Minkies being one of my favourite. The Wrapped Minkie is a fantastic option; the big head pushes a lot of water, and the movement created in the water as a result of the materials used is very realistic. Overall, when fishing for trophy trout, fly selection is very important. And when it comes to your flies one wants innovative patterns (that actually work), tied on quality hooks with quality materials. Fullingmill flies continue to impress over and over again, and are my flies of choice when I’m on the hunt for trophy trout. 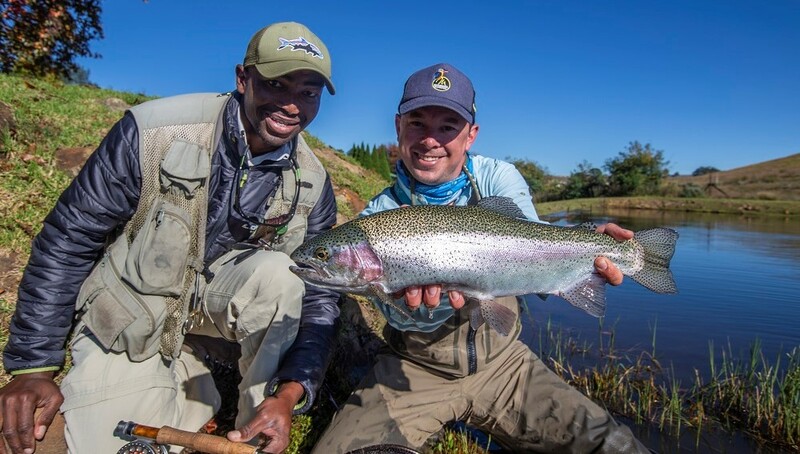 To see these tactics in action join Nathan and the rest of the Mavungana Flyfishing crew on our Trophy Trout Clinic at Hiddendal at the end of June.